The aim within this group is to progress handlers on to more interesting and challenging exercises which start to ‘stretch’ both handler and dog and further develop and hone their handling skills in preparation for participating in the shooting activities for which the dogs are bred. We try to ensure a consistent level of competence and skill level, between handlers and dogs, within this group so that the Trainer can be confident that the exercises are within the capability of all the dogs he/she has in front of them. To obtain this level of competence, we identify a number of basic skills that handlers and dogs need to have achieved in the Starter Class as these provide the foundation for future training. Basic lead work –walking the dog to heel on and off the lead without the dog pulling the handler. An understanding of commands for the dog including verbal, hand and whistle signals. Getting the dog to sit and to stay both close by and at a distance without moving. 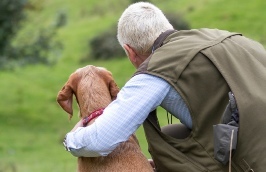 Recalling the dog from a distance, and with a distraction, ensuring that it comes straight to the handler. Use of the ‘stop’ whistle ensuring that dog responds immediately by sitting and awaiting the next command. Ensuring that the dog is ‘steady’ amongst other dogs and when dummies are thrown. Marking of thrown dummies to enable the dog to go directly to the dummy when sent. Retrieving and correct delivery of dummies. The basics of hunting including theory, patterns and whistle commands. 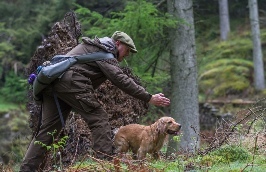 These basic, foundation skills are applicable to all gundog breeds, however, the progression into the Novice class brings with it a change of emphasis in training between spaniels and the HPR/Retriever breeds. 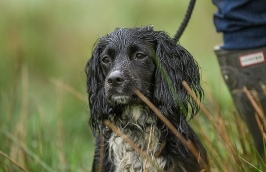 This change reflects the type of work that the breed will typically undertake when in the field and the nature of the exercises that are now undertaken are intended to develop both handler and dog to a level where they are both competent and confident in what is asked of them.